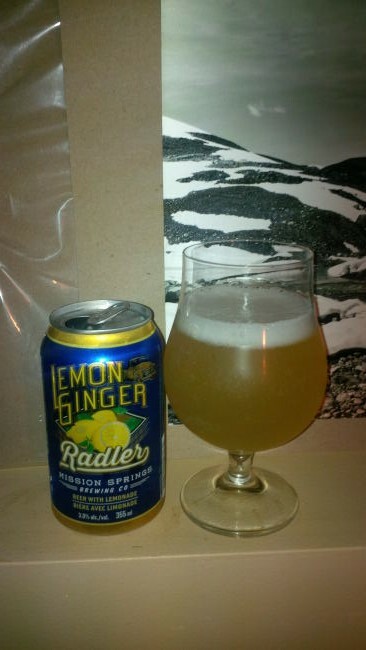 From Mission BC’s Mission Springs Brewing comes their “Lemon Ginger Radler” a mix of their Trailblazer Pilsner, California Lemons and an organic ginger root infusion. The Radler pours a very light cloudy yellow colour with a small white head. The aroma is dominated by lemons, ginger and an overall sweetness that almost reminds me of a craft pop. The flavour is of lemonade, ginger, candied ginger a hint of Pilsner malts and a very mild crisp bite. The alcohol content comes in at 3% with an IBU of 17. I am a huge fan of radlers and this being a non grapefruit radler makes it event better as it is different! If you can find a six pack of this beer but three of them! Commercial Description: This is a light and delicious drink based on our famous Trailblazer Pilsner recipe blended with California lemons and organic ginger root infusion. At 3% alcohol and with a very refreshing lemon finish and light ginger zing, this beverage is perfect summer refreshment and great over ice. This entry was posted in pilsner, Radler and tagged bc, california lemons, canada, candied ginger, craft beer, craft pop, craftbeer, crips, ginger, lemon, lemon ginger, lemon ginger radler, lemonade, malts, malty, mild crip, mild malts, mission, mission springs brewing, pilsner, pilsner malt, pilsner malts, radler.